We all know, that Napoleonic period is probably one of the most popular in the historical miniatures world. As I personally don't belong to the Napoleonic enthusiasts (as I have written before, they leave me as cold as a French bayonet in the Russian winter), I would nonetheless like to know, why? So... I would like to ask all of you, that are into Napoleonics, to state 5 reasons (well, it doesn't have to be strictly 5), why is this period so special to you (and also in regards to collecting, wargaming and painting)? 5 This is the one that i believe might baffle people but despite the slaughter involved in Napoleonic battles it seems to me be the last period where it wasn't mass murder on a industrial scale. No longer very active ,but still own a huge Nappy collection, 1) The uniforms are just the best, in terms of colour and spender , not practicality :smile: 2) The History, watching Waterloo as a child at the cinema had me hooked. 3) Napoleon read The campaigns of Napoleon by David Chandler, particularly the Austerlitz account , you will be in awe of his genius 4) you can mass your troops on the table and they look so impressive. 5) the politics of the period, fascinating. 1) The uniforms - I have to agree here wholeheartedly. 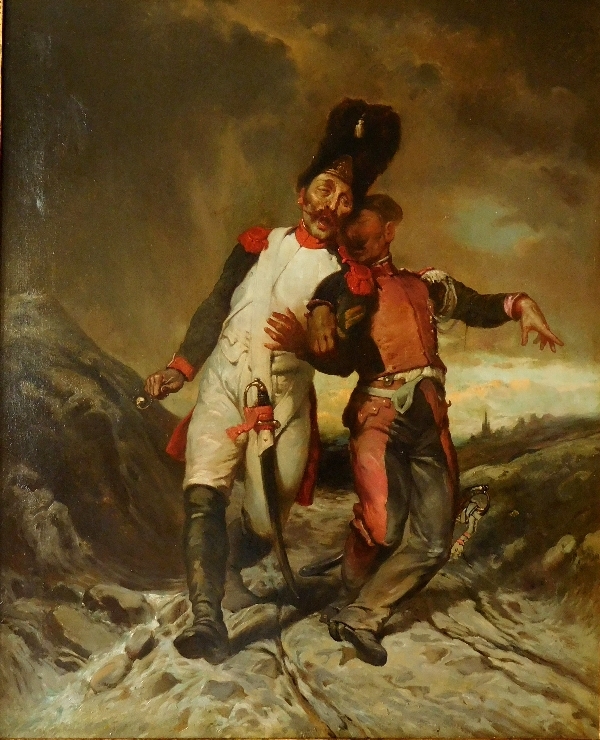 The idea of colorful and unique uniforms reaches its zenith with the Napoleonic era; from there military uniforms begin to bow to the realities of improved weaponry and begin to become less colorful and more practical throughout the century (recognizing that it would truly take the carnage of the First World War to truly abandon colorful and ornate field uniforms). When I first started painting my 1/72 collection back in the 80s it was my intention to start with my Ancients and work my way up through the 20th Century, while painting new sets coming out. I made it up to World War I when I stopped. For me, the less colorful uniforms of the First World War just weren't as much fun to paint as the earlier eras. I can paint up a batch of WWI or WW2 guys in about half the time as I can half as many Nappies, but they're not just as pretty when I'm done. I admit it's a matter of personal opinion and taste. 2) The history - it is one of those eras that changed the history, not only of Europe, but of the rest of the world through its reverberations. At the center of it all was one personality - Napoleon, a fascinating character study in and of himself. Then there were those around him who can be just as fascinating, even if overshadowed by the man for whom the period is named. After all, we don't call it the Wellingtonian or Alexandrian Era. 3) The tactics - As a veteran, I shudder at the thought of standing out in the open with bullets whizzing and popping past my ears, even though I recognize the practical reasons these tactics were used. But there is something about setting those little guys (and here 1/72 scale is great because you can put so many guys in such a little space) up in formation enmasse that is impressive - even at 1/72 scale - then the uniforms and pageantry are gorgeous, even if in the back of my mind I know it is a fantasy as there is no mud, blood, or gore on my toy battlefield ( well, not unless I want it). 4) The scope of the conflict(s); there are just so many different theaters, campaigns, and nations involved. The scope is almost endless. And the period lasted so long even within the era there were changes in uniforms that were marked - not just minor tweaks - as nations and armies adapted to practicalities or styles. 5) And the uniforms. Did I mention that? Oh well - it's the uniforms - they're beautiful, colorful, and fun to research and paint. I can't give you five clear reasons in the same way others have but do share some of their sentiment. I was a child of the "Airfix seventies" and started on 1/32 scale. The Majority were WW2 and then I tried my hand at the four napoleonic sets available at the time. With no internet and very little household income I just copied the box artwork. Eventually I wanted more figures but had no more space so 1/72 was the answer, and the only other economical alternative. Suddenly the WW2 lost their appeal, becoming small brown or grey blurs against the carpet. The other eras, WW1 and AWI didn't fair much better, WW1 were equally inconspicuous and only two sets of AWI didn't encourage a large collection. In short I drifted in to Napoleonics and stayed. I have sinced developed a love of the uniforms and the research available online. I also like to unpick the one-sided jingoistic versions of history that have existed for so long. I don't war game so my 12,000 strong hundred days collection is nothing more than a collection, but I do enjoy painting them, and upgrading the figures when better versions are released. Currently my British/KGL are being overhauled with Strelets and I'm praying nightly for Netherlands cavalry. My reasons are much as already posted. I would stress that Horse & Musket is the premier period to wargame. The troop types & tactics suit table top gaming better than any other period IMO. .......and why not? I only have only the HaT rocket set because it was something different but have no negative views about those who want to model this period. At least Strelet is not making up fantasy sets like those "1946" sets so beloved by certain types of modellers and manufactures. (will probably be called a troll for such a comment!). Huh... now calm down, dear RCD. You clearly misinterpreted my post. Let's try to have a hostility free zone here. As you said "Everyone their own choices! ", although you negate this statement somehow in the same post of yours. I hesitate to suggest this, because of the hostility it might spark, but an interesting thread might ask 'Why not Napoleonics?'. I could offer the opinion that as you need a very large number of beautifully painted figures for the large scale battles that are the signature of the period, it is a lifetime's task. Napoleonics was my first & for many years my only period. Others may not want this type of commitment. Point taken! I will sit down and write out my lines of attrition! I like many periods ww1,ww2 ancient,medieva 7 years war,30year war....and so on...but napoleonics are on my top list.definitly more coloured uniforms more armies involved so many German,italian countries involved,diversity in uniforms and countries even Switzerland,portugal,Sweden,Spain involved not like ww1and ww2 bigger countries less countries involved as garmany and italy became 1 big nations.fighting marching in tight formations.longer period so many changes in uniforms,little countries switching sides..and huge cavalry versus cavalry charges.